Unique moments Photographer was so honored to be part of this wedding. We always help plan the wedding day time lines with our clients so that the photo process is seamless and easy. In addition, we always try to find out if there are any surprises in line that might be planned by family members and bridal party members. So when I asked if there was anything planned for the reception, the maid of honor said " Oh her uncles might be singing a song at the reception ". So we were ready to capture this. Who Knew ? It wasn't just a song. These gentleman stood behind the bride and groom and sang a Family Hymn that would have made the Beatles jealous. Wow, what a moment. 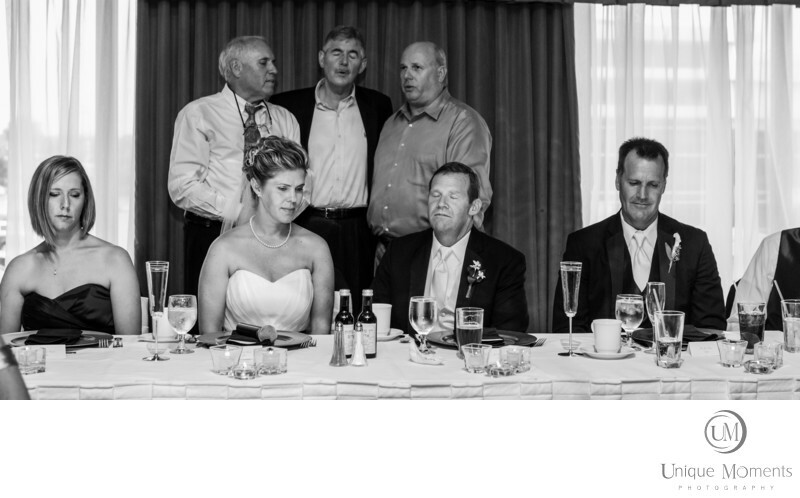 The image speaks volumes about family traditions and why they important to capture at a wedding. To date, one of our favorite wedding images that we have had the honor to capture. Location: 8203 S Hosmer St, Tacoma, WA 98408.